Reducing Costs of Purchased Transportation for State Agencies. Stephanie DiPetrillo, Andrea Lubin, and Michael J. Smart. 127 pages. 2017. 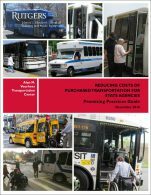 This study sought to identify more efficient and effective ways to provide transportation to consumers supported by New Jersey’s human service departments and divisions.